Natural conditioner and treatment for all hair types. 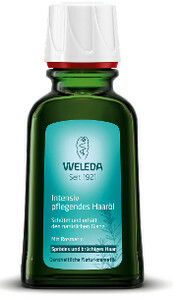 This deep-conditioning treatment restores moisture, softens split ends and adds radiant shine as it penetrates. Organic rosemary leaf extract helps strengthen dry, damaged hair, while organic burdock root extract revitalizes and nourishes hair and scalp. Use daily or as needed for softer, smoother, more manageable hair from root to tip. For an immediate difference in hair’s appearance, use as an overnight replenishment treatment. Massage a small amount into scalp and brush through to ends. Wash out in the morning and style as usual.